Sam is an adorable, clumsy, nervous young lady whose life is not going the way she had hoped. Caught up in dreams of doing better, she meets up with Michelle, an old friend from college, and her glamorous, beautiful Parisian friend Jess. Sam has been enviously following Michelle’s life on Facebook ever since she moved to France, and hearing about her engagement and successful job first-hand only serves to increase her envy. Sam finds herself painting her life in a more positive light than it really appears: she invents a career as a lawyer and pretends she’s still with her old boyfriend, Sean. All seems to be going to plan and she appears to have been accepted by the glamorous ladies. But then her old friends show up. Loud, bawdy and thoroughly dysfunctional, Chanel, Saskia and Paige do not back up the impression that Sam is trying to give. Desperate not to let her carefully constructed lies fall down around her, Sam spends the evening avoiding both groups of women in turn, trying to pretend that nothing is wrong whilst desperately hoping she can keep it together just for one night. The storylines intertwine nicely and there are a few subtly-explored themes, too: the music that plays when Michelle is snorting lines in the cubicles is the same as the tune that accompanies the underage girls who stand in front of the mirror obsessively reapplying make-up. The sense of euphoria on all their faces is much the same, and you realise that the older girls are just that: people play-acting at life, none of them actually realising who they are yet, even if they’re pretending to have it all sorted out. The parallels between the beautiful Parisiennes and the pseudo-glam of the fourteen-year-olds might seem to be few and far between, but scratch the surface and you’ll find they’re pretty much the same underneath. Or perhaps I’m reading too much into it. It is a movie about obsession and desperation. Obsession with other people’s lives and with an idealised version of what your own could be; desperation to fit in, to make people believe your world is better than you yourself believe it to be. It’s about how worries and problems present themselves in the digital age: how people construct a social identity that makes their lives seem so much better, so much more fulfilled, than they actually are. About how we all put up walls all the time, but how social media has made it easier to paint beautiful murals over what is really just crumbly bricks; how easy it is to pretend that everything is fine, and how friendships can break down due to such a lack of honesty. It’s a bit of an odd premise, a film set almost entirely in the women’s toilets, and it’s not the best acting I’ve ever seen. There were parts that felt very much like an A level drama performance; a good one, admittedly, but not quite movie quality. And yet, despite all this and despite the storyline being quite bleak, I left the cinema feeling strangely uplifted. The band deserve a shout-out, too: Spice-Girl-infused-grunge-punk band Fake Club were one of my favourite parts of the movie, and definitely helped to move it from just a bit of an odd movie into something I’d probably watch again. Worth a night out with the girls if you’re feeling like seeing something unusual, comical and quintessentially English in the most current sense of the term. 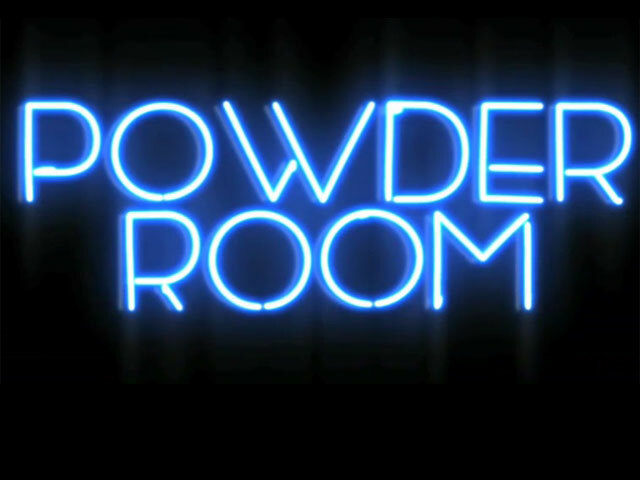 Powder Room comes out in cinemas on the 6th of December 2013.